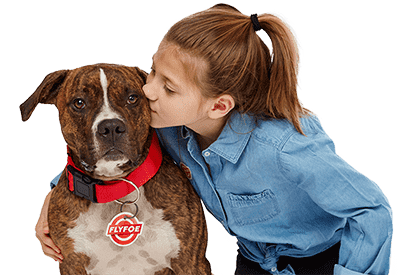 FAQs | FlyFoe :: Mosquito & Tick Control. Just Smarter. Does anyone need to be home when you treat my yard? No, our goal is to let you relax. After successfully treating thousands of yards, we’ve gotten pretty darn good at finding our way around. All we ask is that we can access your yard, and have any neighborhood gates codes and that your pets are safely inside for the day. How often will you treat my yard? The short answer is every 3–5 weeks. The long answer is treatment frequency is based on a wide variety of factors. We strive to be adaptable to all environmental factors that can impact pest population. For example, the weather is a huge factor in speeding up or slowing down the mosquito life cycle: if it’s warm and damp, we treat more frequently; if it’s very hot and dry, we treat less frequently. Our goal is to spray as little chemicals as possible, but enough to be effective. We don't believe in standard schedules since it can lead to too few visits which won't control pest populations, or coming too frequently and over-spraying chemicals. How long will you be in my yard? It depends. If you’re home and you’d like to chat about mosquitoes, we can hang out yapping it up all day. But yard size and landscape density has the most impact on time spent at each house. As a rough estimate, a half-acre lot without much shrubbery or foliage can take about 15–20 minutes; a 2-acre lot with dense shrubbery and foliage can take a half-hour or more. But truthfully, we take as much time as we need to ensure we're protecting you and your family in your yard—and never at any extra cost to you. What we won't do is rush to get every visit done in 10 minutes. We're intent on where we spray, how much we spray, and how to spray...and it takes however long it takes. We survey and target critical areas where pesky pests may be hiding, and will use a handheld sprayer if need be to target hard-to-reach areas to ensure protection of your entire yard. We also include a home perimeter foundation spray to ensure outdoor pests stay—well—outdoors. And we hang and refresh wasp traps if needed/as requested. We price based on the size of the yard and how dense your landscaping is. The All Natural option is a bit more expensive as it costs more than the non-natural products (as it requires a more frequent application). After estimation, we'll give you a price that will run for the duration of the season in your area. You can choose a seasonal package, or pay-per-treatment. The choice is yours! We don't nickel and dime either...charging more for tick control or other bad bugs. We don't charge if you need us to come back to retreat your yard, or if you need an additional treatment prior to a party. Our goal is simple: to give you a single, reasonable rate to handle most of your annoying outdoor pests. Isn't that the way you would do things if you were us? When does your annual program start and end? Seasons vary greatly by region. If you live in the southern United States, you should expect your season to start in February/March and end in November/December. If you’re in the northern parts of the U.S., your season will typically start later in April or early May, and end in October. Typically, mosquito season starts when the average temperatures rise above 50 degrees for three consecutive days, while ticks and other pests can start biting at even lower temperatures; and both seasons tend to end once the first frost hits your area. Our panel of bug experts (entomologists) let us know when mosquitoes, ticks, and other outdoor pests start becoming active. Because outdoor pests are active at slightly different times each year (depending on how warm the winter is or how long autumn stays warm and damp), we determine exact seasonal start and stop times each year in real time. But this is for us to worry about. Just know that we're on it and will handle those pesky pests no matter when they come out. How is your service different than the town/city mosquito trucks that spray? The town doesn't target any specific home yard, and they only really target adult mosquitoes during their active period. Since most mosquitoes can only fly 150 yards from the place they were born, targeting your yard specifically is critical as we can bring the population down to almost zero mosquitoes. And due to the high-quality products we use, our treatments are more effective for longer periods of time. Beyond killing the adult mosquito, we also target them at the egg, larval, and pupal stages. It takes an egg approximately 10 days to become a biting adult. We can’t stress enough the importance of targeting the early portion of the mosquito's life-cycle. FlyFoe also spends significant time searching for mosquito larval habitats. Mosquitoes can lay hundreds of eggs in very small amounts of standing water; up to 200 eggs can be found in a soda bottle cap! By eliminating or treating standing water sources, we further reduce the possibility of mosquitoes developing in your yard...as well as reducing the insecticides that need to be used in future visits. Will your treatment impact my swimming pool, fish pond, or vegetable garden? No, your backyard amenities are safe! Our technicians go through extensive training on the proper spraying techniques including use of smaller, hand-held sprayers for treating yard areas with pools, ponds, and gardens. By using these special hand-held sprayers, we not only avoid sensitive areas in your yard, but we also ensure your yard's treatment is effective and efficient. We have found yards are mosquito and tick-free anywhere from 2 to 6 weeks after treatment. This 4-week variance depends on a number of factors, including weather, proximity to an untreated neighbor’s yard, use of all natural products, and success in finding and eliminating larval habitats. No matter how long a treatment lasts, FlyFoe will be back to keep your peskiest pests away. Do you have an All Natural option? Yes! We offer an all natural option that consists of rosemary, thyme, and wintergreen essential oils. This All Natural option will eliminate mosquitoes on contact and acts as a repellent after it dries. In order to be effective, the all natural treatment needs to be applied more frequently and therefore has an additional cost. What’s the most effective way to control mosquitoes: misting systems, CO2 traps, barrier spraying, or standing-water treatments? At FlyFoe, we use an integrated approach to control mosquitoes and other pests—what we believe to be the most effective methodology. An integrated control plan includes barrier spraying and standing-water treatments to assist in the elimination of larval habitats, targets pests during their early-life stage, killing both active and resting adults, and surveilling to instruct how to proceed with treatments in the future. FlyFoe's treating philosophy does not include misting systems or CO2 traps, as we believe both are relatively ineffective and potentially dangerous. Misting systems kill only a small portion of the mosquitoes on a property, yet spray insecticides at a regular schedule (whether or not it’s needed) and are unable to detect if pets or people are nearby when the system sprays. CO2 traps typically burn liquified petroleum gas to produce the carbon dioxide, and are designed to be left operating and unattended, which can be dangerous. You can read details about integrated approaches on pest control on the United States EPA’s website, and how there is no scientific evidence that misting systems control or prevent the spread of West Nile Virus or other diseases. What is your general business philosophy? We started FlyFoe to do things smarter. We don’t want to be the company that uses the cheapest products or rushes our technicians from job to job. Our goal is to be thoughtful in everything we do. We never pre-mix treatment solutions as we found that the mixture ratio changes depending on when sprayers are filled during the day. 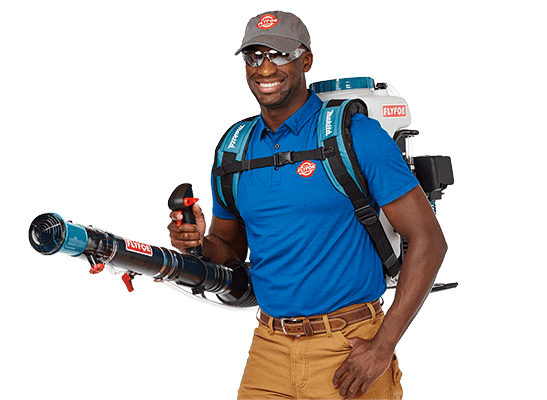 We would also rather use a smaller hand-held pump sprayer to control overspray and get into tighter and more targeted areas around your home (even if it’s easier and faster to use a larger backpack sprayer). Most people won’t know the difference...but we do. FlyFoe might not be the least expensive but we price our services fairly and do the job right. You say you’re Bee-Friendly. What does that mean? We love bees...at least the kind that don’t sting and help pollinate flowers. Our technicians are trained to spray in such a way as to limit impact on pollinators. We also use specially formulated products. So don't worry, you'll still notice those friendly little bees buzzing from flower to flower.